Whilst still resident in Melbourne the Wizard had written to the Anglican church authorities asking them to examine his claims to be prophet. He was prepared to accept the decision of an ecclesiastical court. He received no acknowledgement of his letter but undeterred he set off for New Zealand on his mission.Christchurch in 1974 was a sleepy English-style cathedral town set in the Canterbury plains in the South Island of New Zealand. Known for its extreme conservatism, the citizens could only be roused to political action by infringements on the parks or plans for demolishing old and respected buildings.Anyone who wanted radical change or a fast-lane American lifestyle had to leave and head for Wellington or Auckland in the North Island. Church fetes, rugby football, garden shows, choral singing and the Anglican religion were the pervasive cultural ambiance. The arrival of the Prophet in September that year was a momentous event. 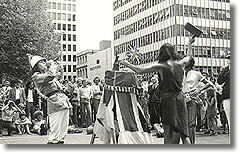 Wearing a brown, animal-skin-like costume he began addressing the astonished locals in the recently improved Cathedral Square on such topics as the evils of usury, the need for an established state religion, the necessity for men to inspire obedience in their wives and the dangers of secularisation, especially multi-cultural, Disneyland type Americanisation. Before starting to speak in Cathedral Square he had taken the trouble to visit the responsible City Council Authorities to show them his letters of introduction from the University of Melbourne, his previous employers, as Wizard, Shaman, and Living Work of Art. 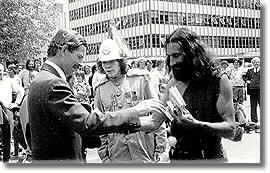 He also provided documentary evidence of his friendly relationship with the Melbourne City Council who had granted him permission to speak in their rather noisy and cluttered city square whilst he lived in that city. He called in to the police station to inform them of his intention to speak regularly in the Square. The police had heard of his not inconsiderable skills as a speaker from their colleagues in Australia and were well aware that he was far from a rabble-rousing demagogue. They advised him to “play it by ear”. Mr Milthorpe, the City Council Chief Health Inspector responsible for such matters, was not impressed by his letters of recommendation from Melbourne and warned him he would be arrested if he tried to speak in Cathedral Square. 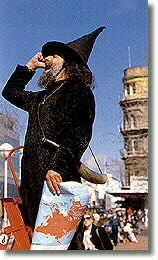 When pressed as to what criminal act this represented, since he never used amplification systems, and had a good track record of bringing spiritual uplift and delight to his listeners rather than “disturbing the peace”, the Wizard was informed that there was a by-law (414) which forbade “speaking or praying out loud” in Cathedral Square. He was obdurate and the Wizard was obliged to inform him that this decision would lead to a head-on conflict: he warned Mr Milthorpe that as a prophet he was an inspired opponent. The Wizard had visited Christchurch the year before to choose a suitable base for the next stage of his calling. He was in town during the Commonwealth Games and recognised that the local people were both very hospitable and quite capable of coping with visitors from other cultures. He also observed that Cathedral Square was an excellent place for a prophet, not only in its dramatic placing in front the Anglican Cathedral, but also because of its excellent acoustics. The only snag was the loutish behaviour of the Christian fundamentalists who harassed anyone crossing the Square with their unspeakable heresies, and the bikies who lounged about accosting all and sundry with foul language. The Wizard has led a charmed life and had never had an injury requiring a plaster cast until during this first visit. Whilst explaining to some fundamentalists outside the Cathedral the error of their beliefs, he was pushed over and damaged his elbow. A visit to the local hospital did not improve matters as the doctor inadvertently punctured a small sac in his elbow which required extensive treatment back in Melbourne. 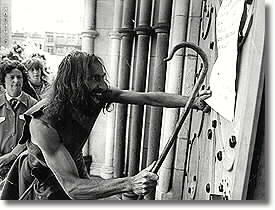 The Prophet began his long career of inspired oratory in Cathedral Square on 17th September 1974. On this momentous occasion a group of drunken roughs threw about twenty eggs at him during his maiden speech (he dodged them all successfully except one thrown from behind) and he was arrested by the police. 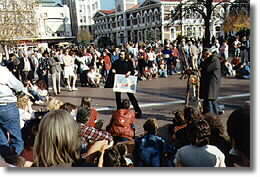 He finally convinced the police that they were acting in a rather strange manner by arresting the victim rather than the perpetrators of the crime, they released him without charge and arrested two furiously fighting women instead.This was the last time anyone forcibly prevented the Prophet from speaking in Cathedral Square, but not from lack of trying. 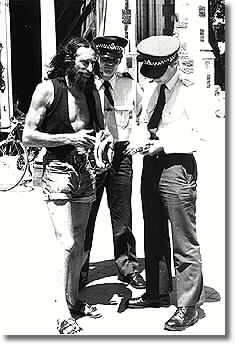 The next day a police inspector interrupted his speech to inform him that he was contravening a by-law by speaking in the square. There was a place next door to the police station on the other side of the Avon River where it was legal to speak, even though no-one ever went there. 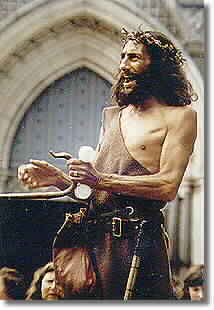 He would only be allowed to speak in Cathedral Square if he obtained a permit from the council. 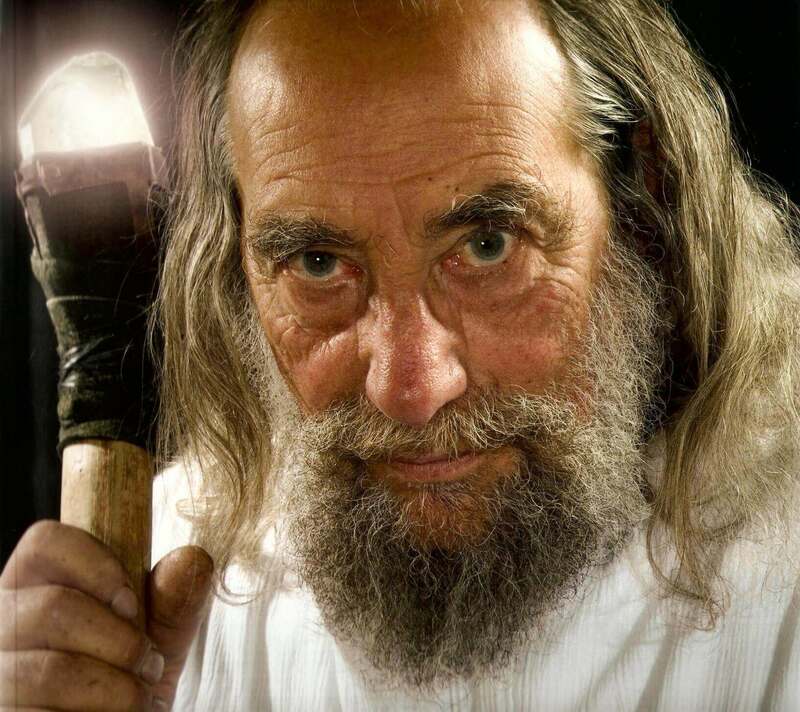 At the time The Wizard was explaining to his large crowd the importance of the British Monarchy and The Anglican Church and was astonished that this was regarded as a criminal act. He promised he would go to the council offices to obtain a permit. He also promised to speak again the next day. Meanwhile the numbers of curious locals coming to hear him speak was steadily growing, especially since the likelihood of a confrontation with the City Council bureaucracy had been reported on the front page of the morning newspaper The Press. The next day the Council refused the Wizard a permit to speak. Once again he committed the unspeakable crime of “speaking out loud” in Cathedral Square. Mr Atkinson, the assistant town clerk, informed The Press that The Wizard was an obvious trouble maker, referring to the incident of the eggs and the brawling drunken women who had broken up his first speech. The council were prepared to reconsider granting him a permit at a later date. However he was warned that the next day he would be arrested if he persisted. The next day The Wizard moved closer to the Cathedral, where the fundamentalists regularly gather to tell people not to be “religious”, like the Anglicans and Romans, but to become Baptists etc. instead. He began to explain that, according to the Bible, the British people were the Ten Lost Tribes of Israel and that the Queen was descended from the House of David. He was therefore dedicated to converting their brothers the Jews to the Anglican faith and to bringing the renegade republican Episcopalians in the USA back to the British Crown and Empire. He was interrupted by the Dean, who had been contacted by City Council officials to warn him that the Wizard would speak there and advising him to call the police. Dean Underhill, a delightful man who later became a friend, unwisely followed this advice and called the police, who accused him of trespassing. 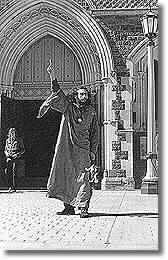 The Dean did however inform The Press that the Wizard was very polite and had given him documents outlining his position as a post-modern prophet vis a vis the modern church. All this took place on Friday. On Saturday the Wizard, attired in a grass skirt and Union Jack shirt, went to the Square and cast an elaborate spell on Mr Atkinson, the Assistant Town Clerk, for his slanderous remarks about his being a provoker of violence. The spell was to “bind up his bowels” for a week. Mr Atkinson took the trouble to assure The Press later that there were no signs of the spell working. Monday came and the crowds and city council officials were awaiting the Prophet’s next move. He appeared in frock coat and top hat carrying a silver- topped cane. Standing on a soap box, decorated with a tea tray bearing the Queen’s head, and carrying a sign saying “Silence !.. No speaking or praying out loud in Cathedral Square…. by order Christchurch City Council”, he began his speech. “It was a spirited if soundless “address” complete with extravagant gestures and consummate mime, leading some members of his audience to helpless mirth, and others to obvious perplexity. What’s he think he’s doing?” was one comment from the audience; “makes more sense than most speeches I’ve heard,” was another”. On Tuesday a large cardboard box was carried into the Square and placed at the top of the steps by some of the Prophet’s “acolytes” dressed in white gowns. The box carried a label dangling by a string, “To Cathedral Square, Christchurch, from Heaven”. Smoke issued from inside the cardboard box accompanied by the sound of fireworks, a bugle sounded and a small Union Jack emerged from a hole in the top. From inside the box the Prophet addressed the crowd in somewhat muffled tones. A youth pushed the box over and was thrust away by the loyal henchmen who righted the box not only on this occasion but whenever the Prophet got too carried away by his oratory to maintain the precarious balance required. Realising that by now the people of Christchurch should be given an opportunity to read something about his message in writing, rather than relying on the media or gossip, the Prophet wrote a piece on Logic, Love and Levity for “Time Off”, a local magazine published by an appreciative editor. The text is reproduced here. Gods’ own people of Christchurch, your prophet addresses you in print for the first time. My message is Levity in thought word and deed, but it is added to the earlier prophetic messages of Logic from The Old Testament, and Love from The New. LOGIC WITHOUT LOVE is empty meaningless rationalising by impotent intellectuals, like the Scribes who knew the letter of the by-laws but not the spirit that framed them. Christians cannot practise this abomination without betraying their founder. LOVE WITHOUT LOGIC is sentimental folly and religious ritualism and leads to sanctimonious Pharisees, with its complete blindness to economic and political realities. Such weak examples of love drive others, with stronger minds, to pursue power and progress instead, which are abominated by all good Christian men and women. LOGIC WITHOUT LEVITY characterises the computer-brained robot who is blind to logical paradoxes because machines cannot laugh or change their minds but go quietly insane and “breakdown” instead. This is the great curse of the 20th Century secular scientists who are an abomination in the eyes of The Lord. LEVITY WITHOUT LOGIC leads to the mindless mockery of fools who laugh at what they cannot understand. Such asses fill the world with their braying and are to be abominated as beneath contempt. LOVE WITHOUT LEVITY is an abomination common to Christians who suffer from cowardice, and is best exemplified in the possessive love of a mother who will not let her children go and a husband who will not allow his wife to live a life of her own. Humourless and heavy-hearted love only produces hate as its offspring. Loving, like giving, is done for own sake, not for the sake of its consequences, and heavy- hearted love is a sacrifice that demands sacrifices in return. LEVITY WITHOUT LOVE is another very common abomination of the Modern Age which abounds in subtle and hidden cruelty. The mean and envious, whose actions are motivated by hatred of their enemies, crucify them through their ridicule. The old and gentle are ridiculed by their young and violent offspring; the devout are ridiculed by political opportunists; the simple and trusting are ridiculed by the cunning cynics who have sold their birthrights for a mess of pottage; the wise are ridiculed by the parrots pouring out of the universities; the taxpayers are ridiculed by those who live off the taxes; and the oppressed are ridiculed by their oppressors. Only when logic, love and levity are in harmony can the soul expand and the heart rejoice to fill the universe with fun instead of poisoning it with gloom and despair. My mission as Prophet of Christchurch is to set an example of Levity based on Love and Logic. Those who deride me as a fool will be humbled by their own folly. Those who fear me as a cruel enemy will choke on their paranoid poison. Those who insist on taking me seriously will be ridiculed for their own obsessive delusions. But those who play with me will have the time of their lives. Here endeth the first prophecy. See Matthew 11, 16-19, and Ecclesiastes 3. In late September wrote a four page letter to the Council offering his services and following up his first prophecy concerning the need to balance logic, love and levity. He emphasised his skill in confounding heretics, like those who had been holding forth unchallenged outside the Anglican Cathedral doors for years (they are still there). For payment he only required help in typing and publishing and cooperation in finding food and accommodation for his humble needs. He informed them that his time may be limited as he was attempting to ascend on December 4th that year. A few days later he wrote again to the Christchurch City Council, supplying evidence of his experience at Melbourne University, where as Head of The Department of Levity he had been given an old lecture theatre (The Cosmological Research and Development Centre) in which he gave lectures on his new synthesis of recent scientific theories in all fields. He asked if they would like him to give similar lectures in Christchurch, free of charge and on their behalf, in the beautiful gothic buildings recently abandoned by the University. The interest shown in his ideas by the large crowds in the Square meant that this was a chance for the council to serve an obvious community need for a new approach to learning. His final approach to the CCC was to ask if they would accept his offer to exhibit himself (clothed of course) “as a free aesthetic entertainment for the citizens of Christchurch”. This time he supplied documents showing that the Director of the National Gallery of Victoria had recognised his unique qualities as a “living work of art”. The CCC wrote back rejecting his offers on the grounds that “the Municipal Corporations Act did not appear to cover the type of activities” he proposed. The Wizard examined the act and found that the council was authorised and expected to provide cultural stimulation for the rate-payers. This they had singularly failed to do for those whose tastes did not extend to expensive concerts or elitist art gallery exhibitions and who were not motivated to go to university “to get a meal ticket”. Tension was rising as the council “suits” got more and more determined to crush the upstart prophet/cosmologer/living work of art. In particular Councillor Newton Dodge, a fundamentalist and Chairman of the Health Committee which controlled the Square, let it be known that the Wizard had been given his final warning. Each day the crowds came to see what would happen and each day the inspired prophet did not disappoint them. Wearing Middle Eastern costume he spoke in tongues for an hour, and was accused by a youth in jeans and bomber jacket of ridiculing Arab culture. He gave a fine speech in fluent French, praising the British Empire and criticising the French for leaving the British in the lurch and backing the German side in 1940. For this he was harassed by an old Returned Serviceman’s League member who thought he was praising the French and attacking the British. He spoke in a gas mask, he wrote on a blackboard. The bureaucrats didn’t dare make a move as he demonstrated the power of logic, love and levity to individuals seriously lacking in all three. Letters swamped the local newspapers, most of them supporting his revitalisation of a moribund city centre. Those opposing him were so vindictive, untrue and stupid that they helped his cause even more than those that praised him. One of the letter writers was highly critical of the Cathedral’s decision to have him threatened with arrest if he spoke on their ground. The writer pointed out that in the past the Church had allowed rabble-rousing, left-wing extremists, who hated both the Church and the Monarchy, the right to speak on their land. Bearing this in mind, how on Earth could they justify their persecution of a witty and humorous supporter of God, Queen and Empire? Presumably this was worse to the Anglican establishment than being a republican agnostic or atheistical communist! This was what the Prophet had been waiting for. Having established the exact point where God’s territory and The Peoples’ territory met, he stood on God’s side and addressed the crowds in the Square who could not be stopped from listening on City Council land. Having failed to find a boat to take him to Antipodes Island in time for the moment of his ascension into heaven (whose whereabouts he had located by a clever use of physical relativity theory) the Prophet realised he was trapped in the world of illusions. He decided to be content with inverting the Earth so that at least he was on top rather than “down under”. He printed and sold, at cost price, hundreds of South Up Maps showing New Zealand in the centre and at the top. These proved more popular with overseas tourists ( who were flocking to the Square to see the living legend) than the locals. British New Zealanders, brainwashed for years by Anti-British teachers, journalists and public servants, were fast developing a cultural cringe to anything American and could no longer stand erect and assert their superiority, even geographical. The Cathedral authorities did not call the police again. It was December, the weather was wonderful and the crowds came to marvel. They could make up their own minds about the value of what the Prophet exemplified in his lifestyle and communicated with his brilliant oratory. His enemies in high places could only gnash their teeth in fury and wait for him to make a mistake or go away and leave them alone. Fat chance! 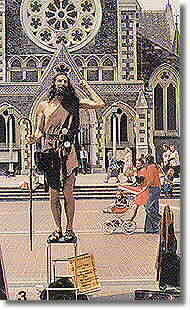 The Prophet printed colour posters of himself outside the Cathedral, plastic white “hot-line to heaven” in hand, and crowned with a daisy-chain. On the reverse side was a brief summary of the British Israelite Theory. He had not given up hope that the Anglican establishment would one day realise this claim to holding both covenants was the key to stopping the left-wing, materialistic, rot which was destroying their link with non-secular history. Together with ecclesiastical acceptance of the account of Jesus visiting Glastonbury, it would provide a popular base for the National Church. More importantly it had the potential to bring about reconciliation and unification between the Anglican Christians and the Jews. Revelation concerning the dual nature of Jesus and His Apotheosis would make unification of Anglican Christianity, Judaism and Islam possible. To those who pointed out that there was no secular- historical evidence that the British peoples of North West Europe were descendants of The Ten Lost Tribes of Israel, the Prophet pointed out that there was no secular-historical proof that Jesus even existed, let alone resurrected from the dead or ascended into Heaven. He recommended they try telling Roman Catholics that there is no secular-historical evidence that St Peter was the first Pope, or that Mary was “assumed” into Heaven. For that matter why not go and tell Jews that there is no evidence that Moses ever existed or tell Muslim’s that Mohammad was not really in touch with the Archangel Gabriel. He himself, when pressed, had to admit that there was no proof that King Arthur or Merlin were historical figures. Even people of quite recent historical origins, like the Americans who invented themselves only a couple of hundred years ago, have popular histories that are more mythological than historical in the secular sense. Try telling Yanks that Betsy Ross did not make the first American flag (her grandson lied about it ), that Paul Revere did not carry out his famous ride (he was captured by the British) and that Washington’s troops were not starving and ill-clad at Valley Forge (they were well-supplied). Even respectable academic historians these post-modern days think that history is not so much an objective scientific discipline as a subtle art of self justification. The article in The Press, where the Dean gave his reasons for calling the police to remove the Prophet from Cathedral grounds, revealed that the Dean and Chapter were currently involved in negotiations with the city council bureaucrats with the aim of transferring control of the Cathedral grounds to the City Council. Enraged at this betrayal of sacred land to the malevolent secular authorities, the prophet girded his loins and hastened to the Square. He delivered a powerful sermon on the need for an Established Church to protect their flock from the unfettered power of the State. “It is neither The Will of God nor The Will of The People that the Cathedral authorities should voluntarily place the Christchurch Cathedral precincts under the abominable by-laws of the C.C.C. Unfortunately a young man, apparently possessed by evil spirits and showing signs of mental instability, tore down the beautiful document shortly afterwards muttering, “rubbish, a load of rubbish!” Fortunately The Christchurch Star had photographed and published a picture of the dramatic incident in its November 11th edition.